It was a busy weekend at Killerfish Games and after much work we’re pleased to announce that ports have made it into Cold Waters. See the Cold Waters Community HUB for more. Ports serve as strategic locations that can be lost or recaptured as the ground war in Europe unfolds. 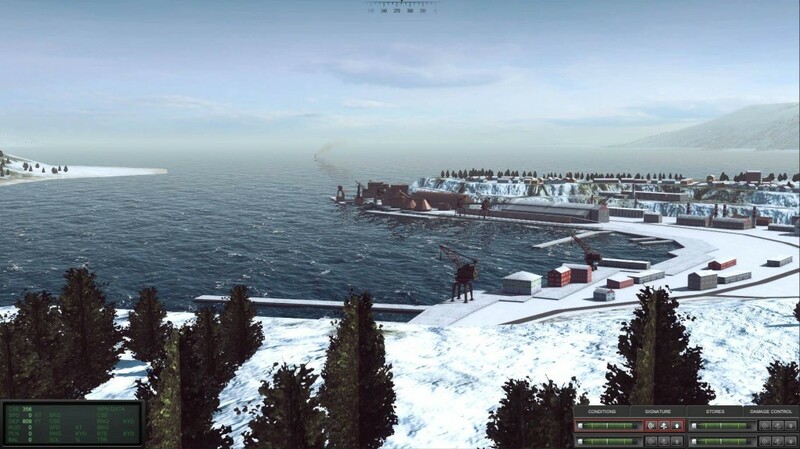 Some ports have airfields and keeping these under your control will enable friendly recon aircraft to patrol the seas looking for enemy movement. But if the enemy occupies these locations, they will be able to launch their recon aircraft instead. Ports are also the focus of insertion missions. For these you will need to return to base, pick up a SEAL team and then make your way to the target port. On arrival, you’ll run the gambit of enemy ASW patrol ships as well as aircraft, helicopters and mine fields in an attempt to drop off your SEAL team while remaining undetected. If successful, your spec ops will perform sabotage behind enemy lines. This sounds great! So excited for the release! Will it be on the Apple Store for Mac or just Steam? Very exciting! The shot of the port looks great. Hey guys, I’m a huge fan of both Pacific and Atlantis Fleets and I have a few questions. 1. Will this game be released on mobile, as I do not have a Mac or PC, I use my phone for playing your games. 3. (And final), How will the targeting systems work? Thank you for your time and I cannot wait to see gameplay in the future! 2. You play NATO submarines against Warsaw Pact ships, submarines and aircraft. 3. You select a contact. Automated TMA (target motion analysis) is performed. You can classify the signature of the contact and/or increase the rate of bearing change to increase the rate TMA occurs. Once TMA is maximum, the contact is plotted in real time. Prior to maximum TMA, the range, course and speed are estimates based on the percentage accuracy of the TMA solution. Wow you guys are really going for the realism factor. Great work so far and I really hope that you guys can get it on mobile, even if not, you definitely have a buyer here! One last question. I recently got a pc for this game. (I’m an over spender XD) What will be the system requirements? Will you ever make a huge update to pacific fleet.more ships,underwater etc? If we did it would be a whole new game. We’re not sure at this stage. Right not we are focused on getting Cold Waters finished, after that we’ll decide where we go next. Will some submarines be quieter then others and be harder to detect? Yes, different submarine classes have different noise levels. I am very interested in this game and am wondering if you would make a campaign on present warships in Russian and US Navies with carriers and surface forces of each if that is plausible time frame present . All it work on windows 10? Is there going to be a mission editor where you can make your own missions for you and your friends, like in dangerous waters and sub command 688(i)? Not directly. But all missions and campaigns are based on text files. You will be able to edit and create your own missions and campaigns, then share these text files. I think the Barbel class submarine should be added. It would make a good addition because it would fit in both campaigns and it would be the only diesel-electric sub in the game. Why not a PacVar campaign? :/ Is there any one planned, for -like example- a DLC? How about a Russo-Japanese war one? !!!!! Just saying. Is there a future for a multiplayer addition to this? will you guys be adding the virginia,seawolf,ohio class subs?